Remember my art installation Earth Blanket exhibited as part of The Biennale of Australian Art (BOAA)? Well it has now been accepted into the North Sydney Art Prize – which is great…. but now how to get it there! What was I thinking – haha…. My latest acrylic pouring painting was my best yet, with lots of cell development in different sizes and good colour formation – very happy with this effort, and will be having another go with the same colours and pouring medium – the trick though is getting the consistency of the paint correct…. My artwork, Earth Blanket, is a ceramic installation comprised of over 20 individual pieces sited at Lake Wendouree as part of the Lakeside Sculpture Work, a component of the Biennale. In total there are 36 sculptures installed around the lake from around Australia. The concept of the artwork is to trigger a re-connection to the Earth via an organic contemplation within the environment using a medium which is of the Earth herself – clay. It is only through a re-awareness of humanities symbiotic relationship to the Earth that we can stop consuming her and begin living with her. I was very happy with my site at the lake; the site being an important conduit to delivering the artwork’s message. BOAA is well worth a visit if you are in or near the Ballarat area – in fact it is worth planning a visit even if you are not! Besides the sculpture walk there are also lots of solo and group exhibitions, performances, music and much more happening, with a combination of both free and ticketed events. And there is plenty of time to visit as the biennale runs till November 6th 2018. You can check out the program on the BOAA WEBSITE. Stay tuned for a post showcasing the fab works of the Sculpture Walk! As readers may know I am somewhat a specialist in pit firing, having explored it extensively during my PhD and then writing a book about it which you can find on lots of online book stores such as AMAZON. Lately I have been yearning to explore more methods of alternative firing. The idea arose when my pugmill decided to die leaving me with lots of clay I haven’t had time to manually reclaim. So I thought I would make an outdoor clay kiln – this is still in the planning stage, and I hope to get it up and running (so that it is ‘fired’) before fire restrictions come in this year. In the meantime I decided to use some of this excess clay – mainly from buckets under the potters wheels which has a high water content – and experiment with a TeePee firing. I did the firing a couple of weeks ago, but hadn’t had time to post it till now – it seems to be very busy at the moment! I am lucky enough to live on a 10 acre property with lots of trees, and it has been a windy year so there are lots of blown down branches scattered around. I began by constructing my TeePee using these branches and then lining it with fence palings which I reclaimed from a neighbour a few months ago. Before lining the TeePee though, I constructed a tripod with smaller branches within the TeePee which included seeweed, cow dung, salt and some copper sulphate and nestled my pots into it. 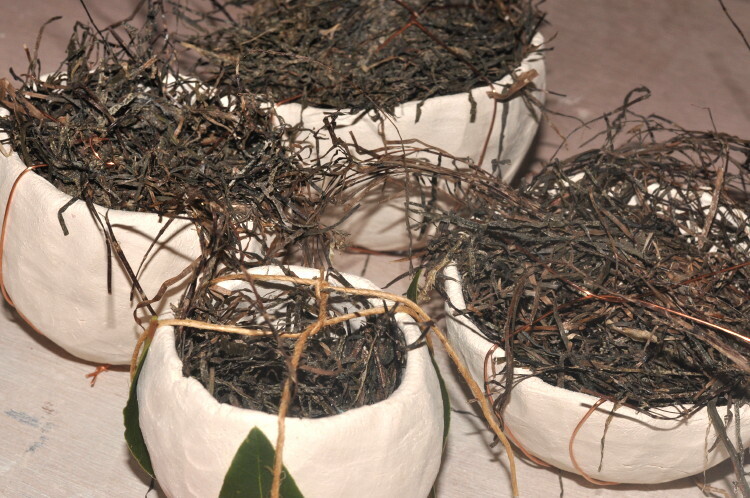 I had previously made a series of pinch pots which were were prepared using string and copper wire wound around the pots to hold on seaweed, gumleaves and cow dung. After lining the TeePee with fence palings I dipped newspaper – in two or three layers for strength – into clay slip, which I had made by using my glaze drill to mix the clay in the potters wheel slag buckets. I then lined the TeePee with this paper making sure I left I left two holes for lighting the fire and a few draft holes to feed the fire. I also left a hole in the top of the TeePee for drawing. The firing was really fun to do and visually splendid and I was very happy with the result for a first effort and intend to experiment with this technique more. Pot Two – love these colours! Pot Three – great copper wire markings here! Pot Four – love the subtlety …. April is National Poetry Month where poets from around the world write a poem a day and post it somewhere on social media – Facebook, Twitter, WordPress, Instagram, Tumbler, the choices are endless (although one could participate as a personal challenge and not share on social media, of course). The idea behind social media, though, is to network and connect, and also read some of the great work of others working in this literary space. As regular readers may know I also have a Poetry & Drawing blog. It began as a poem and drawing a day blog, and after one year of posting I scaled it back to posting weekly. But in April I try to write daily for the National Poetry Month. So far I have been successful in posting daily (despite extending my studio, which will be the subject of this weeks Sunday Studio Visit, so stay tuned)! Recently I have been lucky enough to collaborate with a January art challenge involving makers from the sea glass community. I was invited by Meg from MadebyMeg to participate in this exciting project, in its inaugural year. The brief – to create art pieces inspired by a poem I wrote. The brief for the poem from Meg was that it not be obviously related to sea glass or waves or oceans, but a bit more abstract. The poem was to be uplifting and not obvious, though it could refer to nature in general. So I set about writing the poem…. it was good writing to a brief, something I have not had much experience in, mostly I write for myself about my own feelings and experiences (as do most writers I suspect). Whilst working within the parameters of the brief readers familiar with my poetry may notice some familiarities of course, this is only natural based on writing style. To check out the responses to the poem – which are definitely worth a visit – visit Meg’s WEBSITE. The responses were wide and varied from jewellery to two dimensional pieces, all using my poem and sea glass as inspiration, and were of such a high quality and exhibited a wide scope of creativity. I must admit I had some favourites, and all were jewellery pieces so I may have been a bit biased – but then its all about personal taste, I guess. I’ll leave you with a snippet of the works – over forty works were submitted, so be sure to visit the website to see all the amazing creations. Sunday Studio Visit – visiting other studios! Today’s studio visit sees me reviewing some pics I took whilst on a girls weekend ceramic crawl I participated in on Friday and Saturday throughout regional Victoria. The tour was organised through Clayspace, a Daylesford based ceramics co-operative, of which I was a founding member and director. The course of the trail was dictated by the Sidney Myer Ceramics Award, an international biennial award recognising ceramic excellence, held at the Shepparton Art Museum or SAM. Luckily there are lots of major potters living and working in the central highlands area which meant that a ceramic trail was easily structured that took us from Daylesford to Shepparton and back again. We started out at 10am on Friday morning and the first stop was Barry Singleton’s studio, a renowned Australian studio art potter whose studio was established in Castlemaine in 1970. 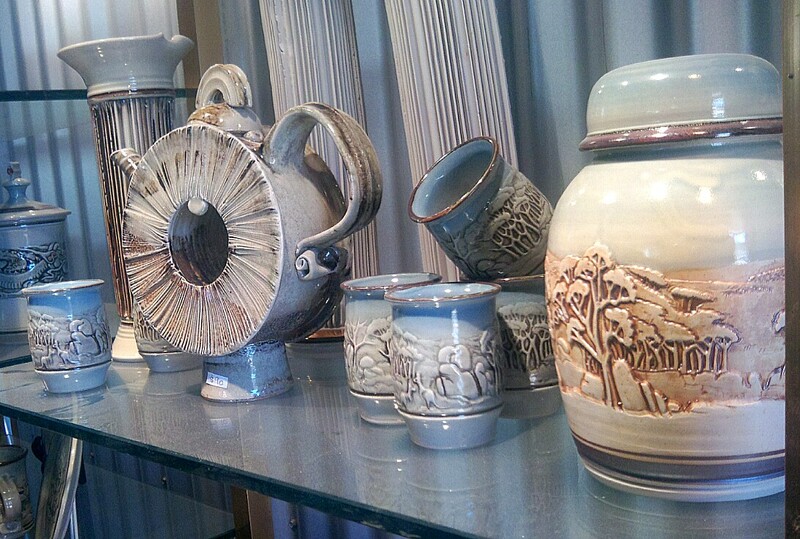 Now in his 70s, Barry was instrumental in raising the profile of studio pottery in Australia during the 1970s. Trained largely in Japan, Barry’s studio set up is amazing, echoing many of the principles laid out in Bernard Leache’s The Potters Book, from clay recycling procedures through to handmade tools and equipment. While Barry was trained in the “form follows function” Japanese aesthetic his work has evolved and matured within the contemporary context to include a range of organic soft forms, art pieces and sculpture to compliment his functional pieces, creating a diverse and accomplished oeuvre. Next stop was Sarah Ormonde’s studio in Bendigo. Sarah is recently back from the Beyond Limitations clay mentoring residency in Sth Korea, which she chatted to the group about over a yummy shared lunch. While Sarah’s work is beautifully functional and is careful and considered, it ventures into the conceptual through the abstracted landscape based marks she makes upon the clay surface using coloured slips and lines. This surface treatment conveys a freedom of expression usually reserved for the abstract artist. This approach, however, is not surprising as Sarah is originally trained in painting and spends alot of time drawing in real time in the environment. After a gorgeous lunch at Sarah’s the next visit was Gary Bish‘s studio. Gary is another hallmark studio potter within the Australian ceramic landscape who, like Barry Singleton, has been working since the 1970s and is a major contributor to the local ceramic scene. Gary has a beautiful showroom, exhibiting so many temptations I had to buy one (I pretty much bought something from everyone). As with Barry, Gary has increased his artist outlook to include a more contemporary approach. While many of his works are based on the vessel, the use of line and decals he designs himself creates a depth and perspective in the work that can sometimes border on early surrealism not the pics I have here – google him & you will see what I mean). Technically innovative, these pieces challenge the contemporary “ceramics purveyor” as they question the viewers ideas about what a ceramic vessel is and what it is meant to convey – concepts very often left to sculpture. We left Gary’s studio at about 4pm and headed for Shepparton, arriving around 5.30pm. By then it was beer o’clock accompanied by some relaxing before heading off to dinner at the local pub. Needless to say after dinner – six girls booked into an apartment… I’ll spare you a pic!! Next morning – an early and bleary eyed start… nothing a greasy breakfast couldn’t fix at a local cafe, and then off to SAM to view the finalists in the Sidney Myer Ceramics Award. The award has been a little chequered in its review this year, even by the the artists we had already visited on the trip, which had generated some interesting discussion about what ceramics “is” by definition from both a purist and conceptual basis. There were five finalists in total, Penny Byrne, Ruth Hutchinson, Sanné Mestrom, Adam John Cullen and Ramesh Mario Nithiyendran, all displaying their work in an installation format, a technique becoming increasingly popular in the ceramics arena. Ramesh Mario Nithiyendran won the award with a body of work exploring the nature of religion, gender and futility through referencing Hindu deities, Christian symbols and sexualised bodies. His use of clay is crude – not being trained in the medium – but this allows him to not be restrained by the historical conventions of the material, so that he exhibits a freedom in the form and surface of his pieces. Though not my favourite in the award it has certainly opened up the debate about the use of clay as an overall art material rather than being purely a ‘ceramic’ medium. My two favourite finalists were the works of Penny Byrne and Adam John Cullen. 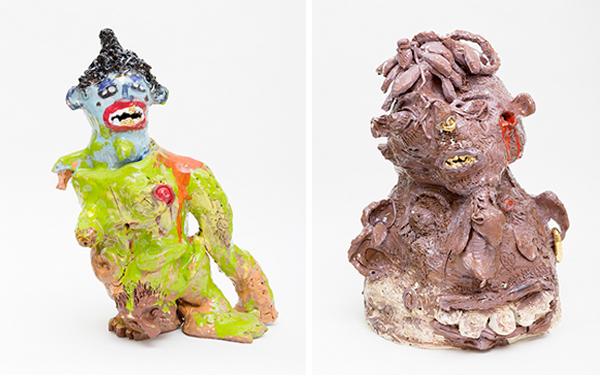 Penny’s work uses kitsch vintage porcelain figurines and found objects to create sculptural assemblages that explore politic themes and popular culture. Again, this work challenges the conventions of what a ceramic ‘award’ is… here we have mass produced figurines presented in an installation, a format relatively new to ceramics compared to other art forms. Penny’s body of work in this exhibition references the war in Iraq, and is a powerful anti-war statement, and while the theme of politics may not be new to sculptural ceramics the coupling of her use of materials may be viewed as controversial to purists who see a ceramics ‘award’ being contained in the more conventional realm of handcrafted and purely object based. Adam’s installation explored the notion of museum curation and the display of artworks, and the time in between when artworks are in the storage area of the museum waiting to go on display – a somewhat ironic theme, which could be taken as serious comment or just some fun and humour depending your mood perhaps. The work is about the placement of objects in a space and the ambience created – very much in keeping with museum curation. I enjoyed the surfaces of the pieces in this installation, but then I am “into” textures and layers. Sanné Mestrom’s work, suitably titled Leftovers, was created by asking artists throughout the world to send remnants of their work which she then combined with unfired clay create a body of work in an attempt to reveal the the original of objects and how they anchored in that meaning, whether cultural, historical or physical. This was perhaps the most controversial work, not due to her method or the finished forms and sculptures, but because the clay was unfired. Unfired clay is technically not ‘ceramic’. Personally I was not very engaged in these artworks as they seemed very slapped together – the components didn’t seem integrated to form a resolved artpiece. Unfortunately I don’t have a pic to show, and I guess that’s why! Finally Ruth Hutchinson’s work Hellmouth, which was not an installation but rather a free standing piece in a separate feature room, depicted a series of figures descending into the open mouth of the abyss. Traditionally trained in ceramics Ruth used dental tools, materials and techniques to create these tiny figures – again challenging the boundaries of conventional ceramics. Overall the exhibition was great – and had mixed responses within the group, which created interesting thought and discussion – but I suppose this means the exhibition has achieved what the curators set out to achieve and what I think they were attempting and that is to present a collection of ceramic works that push the boundaries of contemporary ceramic art practice in Australia. This award has been in existence for many years, and from a curatorial perspective, it would be time to shake things up a bit! I do think it was a great show which made me think about my art practice and at the end of the day that is a good thng! Upon leaving SAM it was back on the bus to visit Graeme Masters in Sweeney’s Creek. Graeme is another large figure in Australian ceramics having worked as a production potter in the heyday of Australian pottery during the 1970s-80s. Today he works in his studio producing wares he makes from an amazing carving technique, which he was generous enough to demonstrate to the group, and teaching at Bendigo Pottery. He also makes some sculptural teapots to break the flow. Graeme had an amazing studio setup including a streamlined process for reconstituting clay complete with settling tanks and filter press. At the end of tour of this process he presented each of us with a bag of freshly pugged smooth white clay – can’t wait to try it out! Next it was off to visit Dean Smith in Castlemaine. Dean was the recipient of the Manningham Ceramic Art Award this year, an exhibition I also had a piece in, which you can see HERE. Dean had recently come back from an overseas trip and was only just getting back into work and had a huge pot on the go which he had thrown in two pieces. He didn’t have much finished work on display as most of it was with the gallery that represents him in Melbourne. We did get to see his studio and firing setup, which was great. Dean is also quite the creative inventor. He rigged up his own spray booth using an old shower base as the floor of the booth, and created an exhaust system for his glaze mixing area using an old oven rangehood! The pic below is not great, but the surface is dry crystalline glazes … something to make the mind boggle! And then it was time to jump back on the bus and travel home – eventually all good things must come to an end. Regular readers will know one of my ceramic sculptures was recently accepted into the biennial Manningham Victorian Ceramic Art Award, an award that has become a fixture on the ceramic awards calendar in recent years, The award is open to all Victorian artists, and spans functional ceramics through to sculptural and conceptual works, as long as the main medium used is clay. 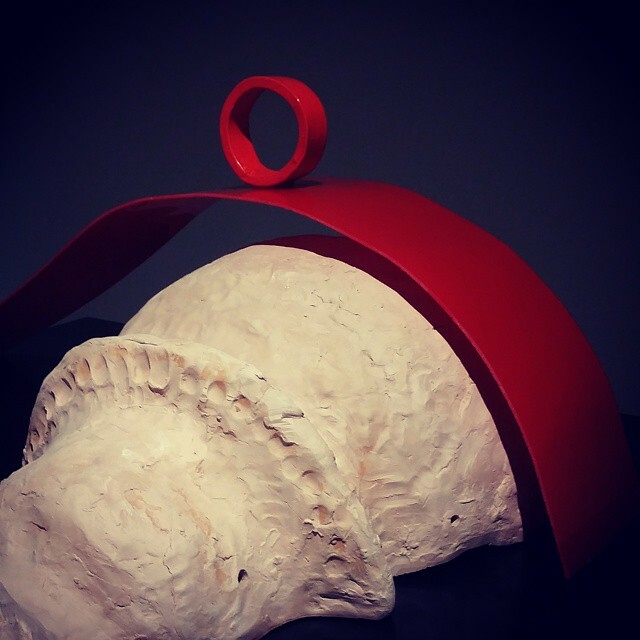 The exhibition opening was held on Wednesday evening at the Mannigham Art Gallery in Doncaster, so now I can reveal my sculpture and give you a bit of information about the conceptual underpinnings of the piece. So what is this artwork actually about? Much of the artwork I create addresses environmental issues, sustainability and the need for humanity to reconnect to the Earth and realise their symbiotic relationship with the landscape. Landscape 1 is the first in a series of sculptural artworks that capture this ethic in both the making process and the finished form. The sculpture was press moulded in two halves using the polystyrene end packaging of a radiator heater. Polystyrene is especially bad for the environment in its manufacturing process and in that it doesn’t break down and so remains a permanent waste product. With some creative thinking, however, this material can be used to model artworks or can be turned into artworks itself. The surface of Landscape 1 is achieved through pit firing, a method of firing ceramics in the ground using organic materials to achieve the mottled coloured surface. When pit firing I only use materials which are found on the ground – old branches, sticks, pine cones, cow dung and leaves. The exhibition runs until the 29th August and there are some fantastic ceramic artworks to see, and buy, from over fifty Victorian artists, emerging through to established. So if you are in or near the area it is definitely worth a visit. 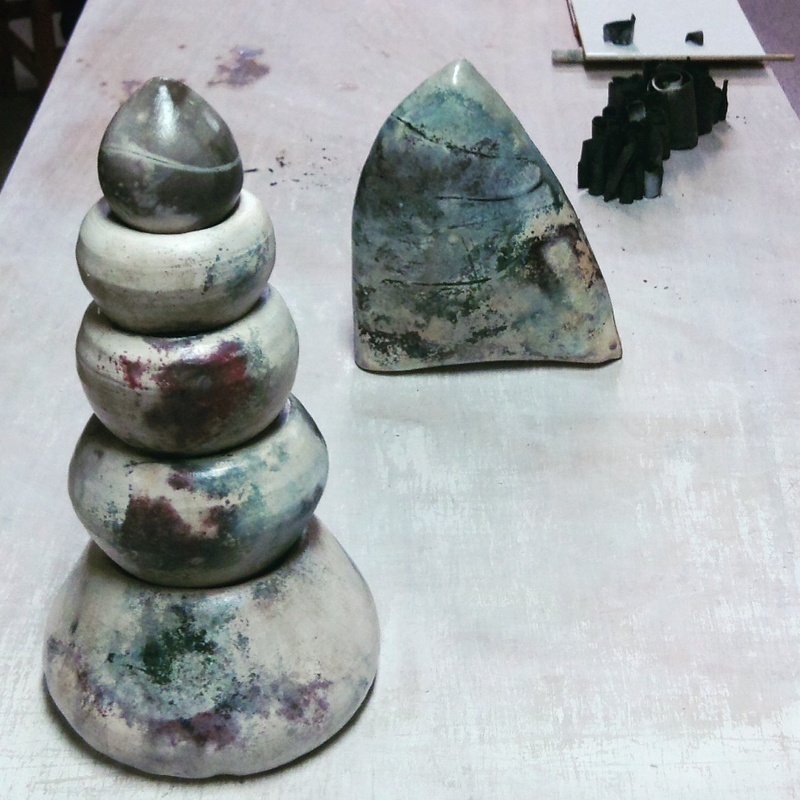 Today in the studio I am finally catching up on polishing the ceramic sculpture I fired last weekend in the pit firing, which was the subject of last Sunday’s studio visit. The piece in the middle of the picture is the sculpture I have had accepted into the Manningham Ceramic Awards which i have to send off tomorrow, and the other two sculptures i need to photograph as proposals for anther two upcoming art awards – fingers crossed. That’s about it for today in the studio…. yesterday my son & his girlfriend visited, and we had a bit of a late night watching movies and chatting, so it was a bit of a late start to the day! Oh Dear…. a few days late again!! Sunday was a bit of a busy day….. we visited friends on Sunday afternoon for a low key housewarming party, and didn’t get home till quite late! The day before, Saturday, I did a pit firing to complete a few pieces I am thinking of entering into some upcoming ceramic awards, and had grand plans of unloading the pit on Sunday and writing my Studio visit blog post – but all I got in before we had to leave for the housewarming was a sneak peek, which I dutifully shared on Instagram. Then yesterday, Monday, I had to go to Melbourne for a catch up dinner with my mum and my two adult sons, and in the process i just get around to getting anything much else done!! So today, Tuesday, I am writing the blog post I wanted to share on Sunday – sorry for the delay!! The artworks I had in the pit include a piece already accepted into the Manningham Ceramics Award, and two other pieces I am planning to enter into other awards whose deadlines are looming. My pit is quite large, and I alter its size, depending on how much work I have to fire, with fire bricks. In this firing I also packed some smaller pieces (which make up one artwork) within sawdust in tin saggars as I wanted to get as much smoking/black firing as possible. The colour responses I attained from the pit are not the best I have ever achieved, but the nature of pit firing is the lack of control and the random nature of the fire based on so many variables, such as the temperature, the season, the wood used, the clay used, the condition of the pit (where I live I can only do pit firings in Winter due to fire restrictions, and it can be really wet cold where I live) and other combustibles introduced to the pit. 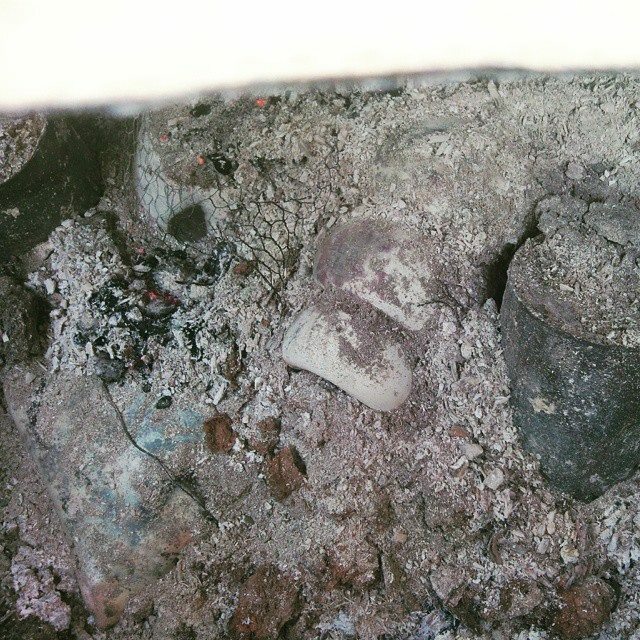 Following is a short photo essay of the procedure I took for the day, but also check out the book I have written about pit firing (yes, unabashed self promotion!) available on Amazon and other online bookstores, plus some brick & mortar stores. After finishing with a final layer of wood the pit is covered with tin to allow for a slow combust over night. So, besides being busy in the studio with ClayMotion classes and the mosaic project with the Ballarat Neighbourhood Centre, and keeping on top of my Etsy shop, I’m trying to also play with the development of some new sculptural forms – coz I have nothing else to do!! PS – I also have a stupid slow computer that wants to keep shutting down which is why I didn’t post a Sunday Studio Visit last week – but of course it is working fine now as I type my draft for this post because it is 2am in the morning!! Anyhows…. as mentioned this week I have been playing around with some new sculptural forms which are little more formal than my usual style of sculpture. These new experiments are much more formal in their design and presence than my usual organic works. This formal and angular design also lends itself to handbuilding, which is a technique I have been growing to enjoy alot more in the past couple of years. I am, however, in a quandary about how to glaze this piece …. currently I like the surface textures…. 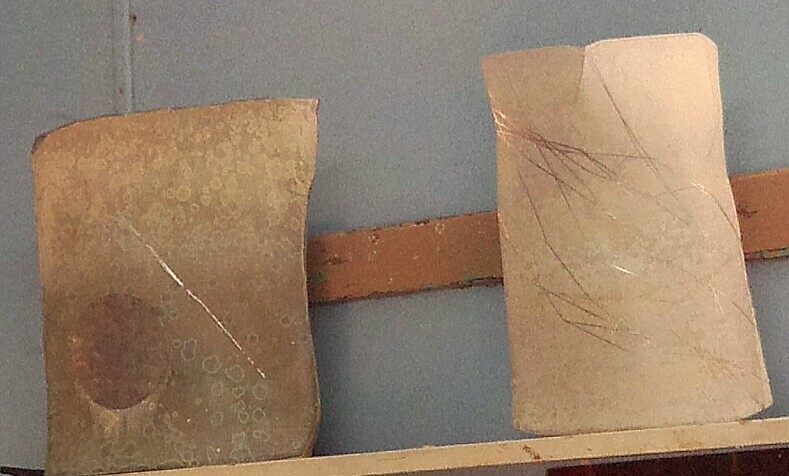 I was thinking of pit firing them which would mean burnishing them which would eliminate the surface texture. So perhaps an organic matt earthy style glaze…. or perhaps pit fired with only a partially burnished surface…. arrgghhh!! Thoughts?